Ryan and I went on a camping trip this weekend and tagged the peak of Mt. San Jacinto. We decided to go light on this trip, with no tent and minimal clothes. We survived and learned a lot for next time. Mt. San Jacinto is in Southern California, just south of Palm Springs. We summited from the south via the Deer Springs trail and Wellmans Divide. I used the Tom Harrison San Jacinto Wilderness Trail Map, but it appears to be out of print. You may be able to find it at REI or you could also try the Wilderness Press San Bernardino Mountains Map. We started our hike at the trailhead just north of Idyllwild on Route 243. Stop at the state park HQ on 243 in Idyllwild for more directions and to get any permits you need. If you start at 4-5pm during daylight savings time, it’s possible to make the first campsite at Strawberry Junction before nightfall. The hike from Strawberry Junction to Wellman Divide has amazing views of Strawberry Valley and Tahquitz Peak across the valley. These views are why I prefer this route to the San Jacinto peak. It is possible to hike from the Strawberry Junction campground to the top of San Jacinto and back down to the trailhead and your car in one day. This is quite a difficult hike though. If you want to take it easy, summit on day two and spend your second night in Round Valley or Tamarack Valley campgrounds. This also give you the option to hike to the Palm Springs Aerial Tramway for a well-deserved dinner and beer after coming down from the summit. I’ve done this hike twice, in March and late August, and have found running water both times along the section between Strawberry Junction and Wellman Divide. I recommend bringing a pump / filter, similar to this one from MSR, because your only water may be in standing pools that are quite dirty. 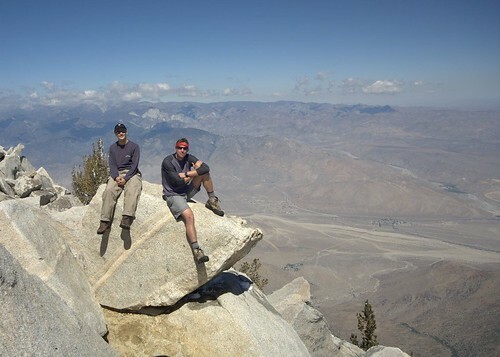 It’s possible to summit in one day by taking the Palm Springs Tram to Long Valley. Ryan and I consider that cheating, though, and we will award you no points. Thanks! The nights were cold last weekend, in the low 30s above 8000 ft. The days were beautiful – sunny and warm. We encountered only a couple of sections of snow and ice, which were manageable without crampons. Enjoy the hike! Thanks for posting the pictures. I’m planning to do almost the same hike on June 2 with a friend of mine. We’re planning to start from the Deer Springs trailhead, hit the summit, hike down to the Aerial Tramway, meet our wives for dinner there, and ride the tram down. We’re hoping to do the whole thing in a single day. Do you have any beta about the hike you could share? Difficulty level (most websites say “moderate,” but one said “very strenuous”)? Doable in only one day? Anything else I should know? Overall I’d rate this hike “moderate” and consider it doable in one day, especially since you’ll be traveling light. The steepest parts are from Wellmans Divide to the peak and a few smaller sections between the trailhead and Strawberry Junction. When you reach Strawberry Junction, make sure to follow the PCT to the east towards Wellmans Divide. The friend who joined me on this trip said that the other route to the peak (via Little Round Valley) was much steeper and not as scenic. The section from Strawberry Junction to Wellmans has beautiful views of Strawberry Valley, Suicide Rock, Lily Rock, and beyond. It took us 2 hours to get to Strawberry Junction, 2.5 hours to Wellmans, and 1.5 hours from Wellmans to the peak. The return trip from the peak to the tram is all downhill and can be knocked off in a couple of hours. Enjoy it, especially the meal and drink at the end of the day!